born in 1956, has devoted her life to improving the quality of the individual’s embodied life experience. Her work began in social education, focusing on children in custodial care taking situations. She quickly became dissatisfied with the disparity between the needs of the children and the available options to improve their quality of life. This experience galvanized her mission. She became a psychotherapist and art therapist, acquiring a long history of experience and training in body psychotherapy and energetic therapy. She focussed strongly on integration of the soul-body level. Gabriele has trained extensively in the work of Moshe Feldenkrais and Eutonie, in addition to training with Chuck Spezzano and Carl Simonton. She took trainings in different energy-therapy methods, for several years in the Hawaiian traddition. 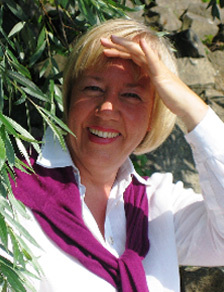 Gabriele is a teacher of the German Acupuncture Society since 1999. She has co-created with acupuncturist and author Gabriel Stux, “Energy Medicine and Therapy” which is a unique combination of Chinese Medicine and Biosynthesis. Their focus is also on integrating soul-body connection. Becoming aware of our purpose of life. In 1999, she began teaching in Europe, Switzerland, Israel and the United States and continues in an active and dynamic role as an international educator. In her private practice, Gabriele includes a specialty focus on prenatal and perinatal psychology: teaching midwives how to support their client’s pregnancy; dissolving the pattern of delivery that we experienced in our own transition from the womb; and guiding women during pregnancy and delivery. Additional specialty experience includes supporting people in hospice care and guiding transitions from life to death. co-founder Silvia Specht-Boadella and founder David Boadella in Switzerland since 2000, after studying Biosynthesis for 5 years with them. She has earned the highest levels of training as a diplomate therapist of Biosynthesis, international trainer, and supervisor. Her work is rooted in this multi-dimensional, multi-cultural approach.